not work !! 🙁 . what i need is read frecuencies from an function generator with MSP430G2553, I connect this generator in P1.0 Pin (Timer_A0) and I have code, but I can’t show nothing with the serial Port 🙁 . Help please. If I need to Blink this code in TIVA C EK-TM4C123GXL, how can i do this ? I need a frencuancy counter. help please … some code for me ?? The basic code format should work, there maybe some function calls for the Tiva C that differ. The TI forums and 430h.com is a very useful resource with some very knowledgeable users, also look for the peripheral Driver Library PDF for the Tiva C this will be a valuable resource. I’m a student from Germany and i’m not very good in programming microcontrolles. I try to do a Flow rate sensor working on my LM3S8962. The flow rate sensor is an YF-S201. It just changes his outputsignal from 0 to 4.7V (it isn’t any problem to decrease the voltage by a simple cirquit). It gives a max. The sensor outputs approximately 4.5 pulses per second per litre/minute of flow. Well now the question: Is it possible to combine this program with my flow rate sensor to count the signals higher than 0V and to count the time the water is flowing trough the Sensor? I wouldn’t ask if I had any idea of this stuff. If somebody has any idea I’d be happy as a child eating a chocolate cake. Ok from what I could see the YF-S201 outputs a pulse every 2.25 milliliters of water, the greater the water flow will mean more pulses per minute. So if you count the pulses in a given time, you can then calculate the flow rate. Set the timer counter up to be 10 seconds and count how many pulses are in this period, then use the total pulse count as a multiplier for 2.25 milliliters and multiply that by 6 (6*10 seconds is a minute), you then get a flow rate per minute. You can try a 1 second timer as well and really depends on the amount of water flowing, this can all be converted to something like cubic metres per minute then. I would like to ask you about my problem, what i am facing on frequency measurement. I hope somebody can help me clear my problem. 1. 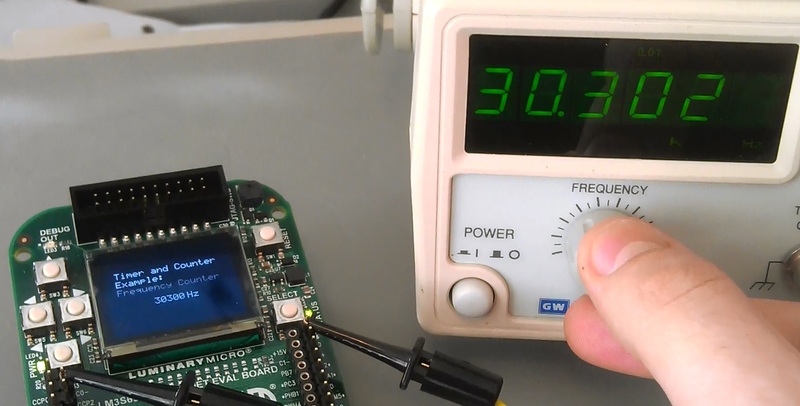 Generate PWM on timer1 for PWM module. 2. 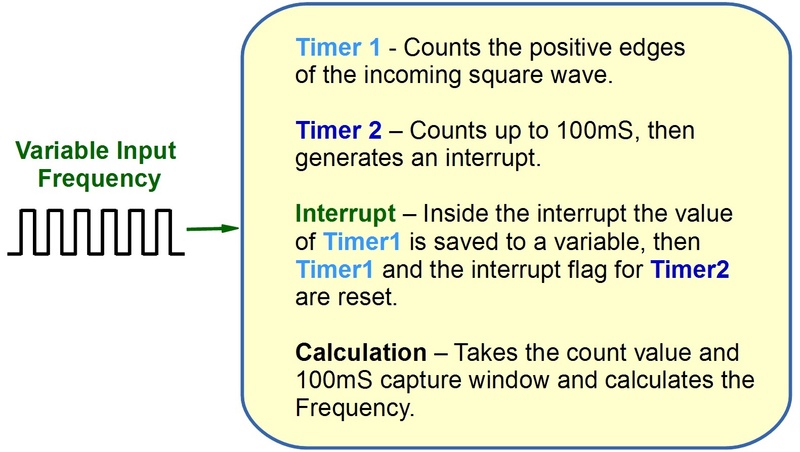 Timer2 for for timer each 1ms to caculate frequency. 3. Timer0 for configuration count down rising edge. I have check on osiloscope the pwm and timer works fine. But only FREQUENCY COUNTER on timer0 does not work as i set up. Could you help me to have a check and share with me my problem i’m facing. Firstly, thanks for your article. Secondly, I would like to ask you about my problem, what i am facing on frequency measurement. I hope you can help me clear my problem. Could you help me to have a check and share my problem in details. // TODO: Rework this for the timer you are using in your application. // number of edges have been counted. // so re-enable it here. Thanks for taking the time to look at the site and this post. I have not worked with the Stellaris for awhile and not had the opportunity to work with the Tiva C at all. 1) Find a Tiva C example where the timer is being used as a count down timer, then read through the code and look at the functions involved in this operation. Familiarise yourself with the code so you can happily change the parameters. 2) Simplify your code to the basic operations and it maybe better to use an external frequency counter at first. Possibly even remove the UART code and view the variable that stores the frequency in CCS. 3) Integrate the codes from steps 1 and 2 and once working then bring back the PWM generation. I know this is not an answer, I am little short on time at the moment due to exams and work commitments and intend to start posting back on the site more over this summer. I will be working on a project using a Tiva C towards the end of May, but I doubt this will be any help to you by that date. I would also highly recommend posting on the TI forums, there are experts on the Tiva C who will know the peripheral steps and function operations. I will check and do it as your recommendation. I hope it can be resolve soon :). because this is nice functionlity of Timer module :). Do you have this code for LM3S8962 ? No sorry as I don’t have access to a LM3S8962 development board. You should be able to port it though, the function calls are highly likely the same as there are generic peripheral drivers for the whole Stellaris range. There is likely to be a different port and pin usage, but if you check the datasheet for your board it should provide this information. The code you posted is the interrupt handler, so you just paste what ever code you need to perform inside the interrupt handler. 1. Why did you assign “float time = 0.1″? is that 100ms/1000ms conversion to second? 2. Why did you set the Timer load value to 10000 but not another value.like 800000 maybe? 3. How come ” count = (10000 – timer) * 100;	// *100 converts kHz to Hz for easy displaying” really convert kHz to Hz (you only multiplied by 100 in this case)? 4.How come the count in kHz? 1) This just divides the result by 10 but I chose to multiply by 0.1 which has the same effect. It is used to move the decimal place so the frequency is accurate, and as displayed on the function generator in the video. I didn’t bother using a decimal place in the code and calculating the modulus, as this was just a quick demonstration. 2) A larger number could be used but this was fine for the demonstration and frequency range used, for higher frequencies you will need a larger count. 3) See answer 1 and check the video for code operation with a function generator. 4) As per answer 1, the function generator displays the frequency with a decimal place. hello, the function PinTypeTimer(CCP2); how its works? and wich pin I put the square signal? PinTypeTimer(); configures the specified timer pin to function as a timer pin. The parameters you can pass here are CCP1 to CCP7, depending on which GPIO pin and timer you are using. Ok it would help if I hadn’t missed a zero in my comments 🙂 should be 8MHz/10 = 800,000. If we now take the reciprocal of 8MHz we get 125nS, therefore 125nS*800,000 = 100mS. Have corrected my comments on the code! Can you tell me how the SysCtlClockSet() function works and how to enter the parameters correctly? More what are the main steps in writing a program that uses timers or any other peripheral? No worries, I can run through the SysCtlClockSet() function. I will use two examples, one from the code in the Timer example SysCtlClockSet(SYSCTL_SYSDIV_1 | SYSCTL_USE_OSC | SYSCTL_OSC_MAIN | SYSCTL_XTAL_8MHZ);, and a second showing a 50MHz clock. SYSCTL_SYSDIV_1 This is the system clock divider, in this case it divides by 1. SYSCTL_USE_OSC | SYSCTL_OSC_MAIN Are used in combination with each other, this then configures the clock to be taken from an external source (8MHz crystal in this case). SYSCTL_XTAL_8MHZ This just selects the external crystal frequency, the maximum external crystal value is 25MHz. Now the second example can be used to show how to configure the clock to 50MHz. The second example has 2 parameters which are different, but this changes the clock from 8MHz shown in the first example to 50MHz. SYSCTL_SYSDIV_4 This then divides by 4, therefore when using the PLL (LM3S6965) it’s 200MHz divided by 4 hence 50MHz. With the Stellaris setting up the clocks and watchdog timer is first as with any microcontroller. Then enabling the peripheral modules like ADC or Timers, as by default they are off and then not using power or resources if not required. Then you set-up the peripherals and configure them as required, followed by enabling them. Hope this helps and if you have any further questions I will do my best to help. Thank you for the little lesson here 🙂 and for your time too.